House poor typically means spending a considerably high proportion of your income on housing costs, which include the mortgage, property taxes, and insurance. Many financial experts recommend keeping overall housing expenses below 28% of total gross income and keeping a reserve for maintenance. (Find out your housing expense ratio with this calculator.) Regardless of your actual situation, you are house poor if you are continually stretched, have no extra money, nor any ability to save for emergencies because of your sizeable housing payments. There are several ways to get yourself into this tricky situation. Many people push their home purchase price to the upper limits of what they can borrow. Unfortunately, just because the bank agreed to lend a certain amount doesn't mean it was wise to take them up on the offer. Or, perhaps some event has changed your income for the worse. Significant, unforeseen events can happen, but even things like not getting that raise you were banking on can do it. Less income to cover anticipated housing costs can certainly leave someone living on the edge. 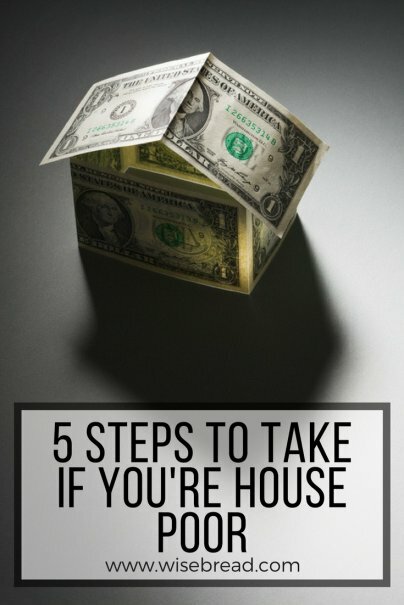 If you are cash strapped due to your home, figure out if your income really can change going forward. You need to be honest about the odds of this happening, however. Only tangible scenarios, such as starting a higher paying role or beginning to have two incomes with a spouse returning to work, for example, should qualify. Realistically assessing if your current situation is indeed temporary and how long it will last may mean you can stem the tide for some time. You may need to be prepared to make some big changes upon examining your budget, like sacrificing certain luxuries, making lifestyle adjustments, or halting all discretionary spending entirely. This may not be a fun exercise, but if you are set on keeping your home, then prioritizing your non-housing spending is a must. Additionally, be smart about any renovations and additions. The kitchen may need a cosmetic update, but remodeling should be put on hold. And keep in mind that often work can go over-budget. Furthermore, with new homes, many people rush to buy new furniture and decor, instead of spending more strategically. If you are already tight on cash, hold off on such expenses and focus on keeping savings for critical maintenance only. If you are already making great personal sacrifices, like working around the clock or giving up all fun things, you need to figure out if it's truly worth it. Understanding what's motivating your desire to hold on to your house may not be an easy soul searching process. Some people have it deeply ingrained in them that their particular house is the only way to make their family happy. Others may find they are only keeping up with the Joneses or that giving up their current house means failure. It's a personal question, but if you end up defaulting on your mortgage or getting into serious trouble with your other obligations, then it becomes a real responsibility issue, and you need to take action. If you are house poor, it's important to take hold of your situation and figure out your options. The housing market collapse several years ago has certainly been an eye opener for many in terms of overextending. It's important to chart your course wisely and learn from prior mistakes. Have you been (or are you now) house poor? How did you bring more balance to your finances?